I once had a guy ask me if he could use my resume for his own job search. After a double-take, I realized what he meant – he was a part of a church staff that interviewed me a year earlier and he wanted to use the template I created for my resume for his own. Some churches aren’t looking for you as much as they want the idea of you. Consciously or unconsciously, many congregations are hoping to fix a perceived problem with their teens by throwing “a youth pastor” at it. In this instance, your resume can say just about anything remotely safe and they may hire you without a quality interview process. Some churches are looking for the opposite of their last youth worker. The individual had strengths, but ended the role with more faults and weaknesses coming to the surface. Again, a senior pastor or search committee may merely want to know if you can do things the last person couldn’t do, not realizing that they’re hiring your weaknesses as well as your strengths. Some churches aren’t as technologically savvy as you are. 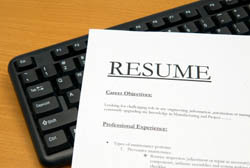 Instead of relying on a personal website to be your resume, create one on paper that can be emailed or sent snail mail. There are many congregations who like to have something in their hands to pass around in a meeting, and if any older individuals are a part of that committee you may make them feel out of the loop. Break the rules: What separated my resume from many others is I didn’t follow standard resume rules, such as, “Keep it all on one 8.5×11 piece of paper, one-sided, with one font.” I bought quality textured 11×17 paper and created a “book” format – a cover page with my core information and personal vision statement, as well as a mission statement about what I was looking for. This opened up to a full 11×17 page of sections that included, “About Me,” “Employment History,” “Achievements,” and more. The backside of the resume listed my educational history and references. Speaking of references: Don’t wait to be asked for them – include them, and check to make sure those listed are okay with getting a phone call from strangers. If you have any potential blackballers who may say something bad about you, include another reference from that church who can speak from an alternative perspective. You don’t want to avoid listing senior pastors you’ve worked under who don’t like you, but you can list a volunteer you did see eye-to-eye with. I’ve also found students can sometimes write a quality recommendation letter you can include as you send your resume out. Use pictures strategically: I created a full column of 8 pictures on the left and right margins of the resume interior, and then moved the text more toward the center of the page. Be intentional about which pictures you use, such as putting family photos near personal information, or a larger photo of you teaching on the cover. Share more than bullet points: As you list your work history, include more than where and when – share a statement under each about, “What I learned about ministry here:” and, “What I learned about myself here:” to add color commentary. This helps a prospective church to see you as a person on a journey instead of a rookie or a know-it-all.